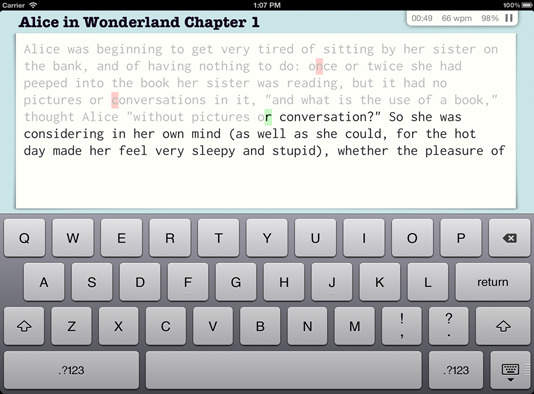 Master typing on your iPad or iPhone! Focused lessons improve your typing speed and accuracy and allow you to get the most out of the iOS experience. Invest in your typing. Invest in yourself. TapTyping has a comprehensive curriculum with courses ranging from Beginner, focusing on the A through Z keys; to Advanced, focusing on tough patterns, symbols, and numbers. Every keystroke is tracked to the millisecond to provide precise feedback. You can observe your progress and spot your weaknesses so that you can re-take lessons and hone your skills. Compelling content keeps you coming back. Type excerpts from U.S. history, follow Alice down the rabbit hole, or type the tweets in your Twitter feed to get something new every day.